The D-backs’ starting rotation received a strong boost last week when new left-hander Zach Duke was activated from the disabled list. He was traded to Arizona during the offseason, but suffered a broken hand in Spring Training, which kept him off the mound for the season’s first two months. 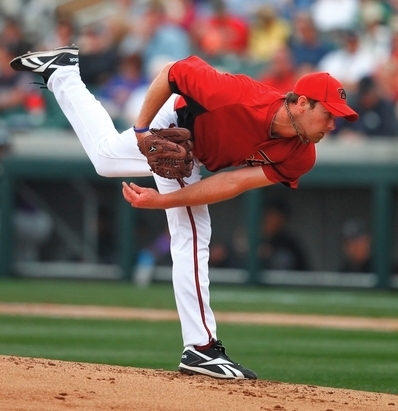 Duke made his D-backs debut on May 28 against the Astros, tossing seven shutout innings to earn the win. He was just as impressive in the batter’s box, as he smacked a three run home run. D-backs Insider caught up with Duke to talk about his debut and the team’s recent success. DI: Talk about a strong first outing of the season, was it good to be back out there? ZD: It was a lot of fun. I was very thankful to get back out there, and for things to turn out the way they did. I couldn’t ask for much better. DI: You helped yourself out at the plate as well. Were you a little surprised to see that ball get out of the ballpark? ZD: Absolutely, very surprised. My first pro homer for sure, the very first one. DI: It had to be hard to come to a new team and get hurt in Spring Training. How hard was it to be sitting when your team was playing? ZD: It was very tough sitting there watching. When the team’s on the road I had to watch on my TV. I didn’t miss a pitch. I was being a big fan of the team every game, living and dying with them when they win and when they lose. To be back and to be a part of it now, it’s a very good feeling, especially with the way we’re playing very well. To be able to contribute in a positive way, it feels very good. DI: You mention that the team is playing well, that’s got to be exciting for you to come back and be on a first-place team. ZD: Absolutely, it’s the first time in my career that I’ve been in first place past April. It’s a great feeling. We’ve got a good thing going, a lot of great guys. We’re having fun with it right now and that’s the main thing. We’re playing the game the right way. DI: So overall how’s the transition from Pittsburgh to Arizona gone? ZD: It’s been easy. There are a lot of great guys in the clubhouse that have welcomed me. Even when I was hurt, they made me feel like a part of the team. That’s really all you can ask for.